Each Saturday this month, I'll be sharing my weekly meal plan for breakfast, lunch and dinner that are all within the Whole 30 guidelines. I'll also share a shopping list that has every ingredient that you'll need for three meals a day for all seven days. Since we're all busy people, I will also include tricks on how to prepare some of the food ahead of time- which I will be doing on Sundays. This way, you don't have to think about what you're eating- just grab your already-made food and go! Since this is my first time doing a Whole 30 challenge, I'm going to be learning a lot. This is my first meal plan that I'm putting together, so I might need to make adjustments. Hopefully by next week, I'll have a better idea of how much food I need to eat (specifically with marathon training starting up). I'm learning and experimenting as I go, so feel free to give me suggestions or tell me if something is a bad idea. I will appreciate any feedback! Now, let's get to the plan! For breakfast, I'll be having a kale and sweet potato hash five days (the days I'm in the office), and a chia pudding twice. The pudding can be made ahead of time, and all you have to do is add pistachios before eating. Once again, I'll be having one meal during my work week, then a separate meal when I'm at home. For work, I'll be having a burrito bowl! The meat can be made ahead of time in the crock pot and stored in a container. To take to work, I put the meat and tomatoes in the bottom of a mason jar, then top with avocado, cilantro and finally lettuce. All you have to do is pour it out when you get to work! I'll also take some fruit to have with my lunch as well. The lemon chicken can be prepared ahead of time and frozen. You can either pull out the bag the night before for a faster cooking time, or pull it out that day and leave it in the slow cooker. The added veggies help finish out the meal! Combine 1/4 cup extra virgin olive oil, juice of one lemon, salt and pepper. Pour over chicken breasts (2 large ones) in a freezer bag and freeze. When you are ready to prepare chicken, remove chicken bag from freezer. Pour into crock pot, and add 4 chopped carrots, 4 chopped celery stalks, and 1 chopped onion. Cook in crock pot for 6-8 hours on low. I'm really excited to try out this recipe for a mocha pot roast! This makes six servings, so I'm planning on getting a slightly bigger roast to make it last for seven meals. I'll be able to make it in the slow cooker on Monday, then divide up seven servings and eat it all week long! On the side, I'll be having any leftover fruits and veggies that I have, or make a side salad. I tend to not be very hungry at dinnertime, so this will probably be my smallest meal of the day. Next week, I'll be posting about some fueling options for runners, and some snack ideas that are Whole 30 compliant. Be on the lookout for that! 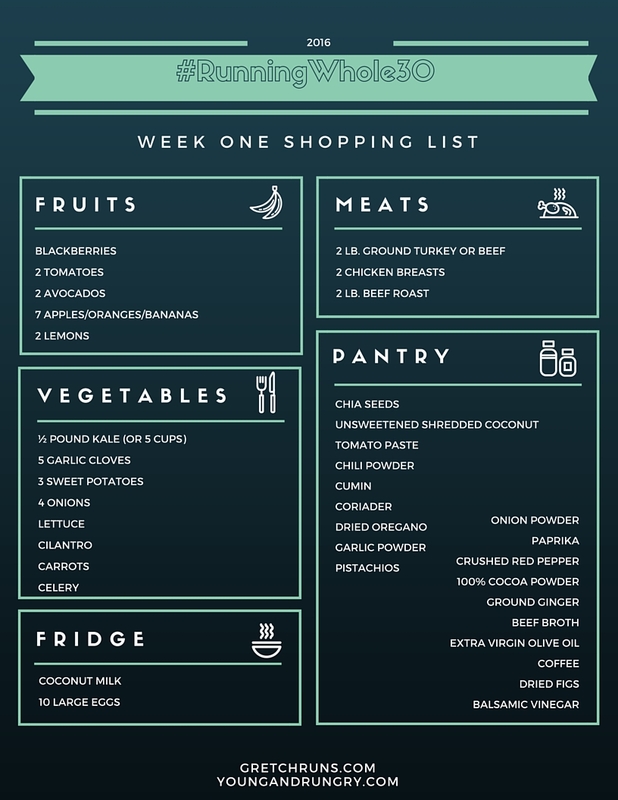 Here is my shopping list for my Week One meals. I hope you'll find this helpful when you go shopping! Are you in the Whole 30? 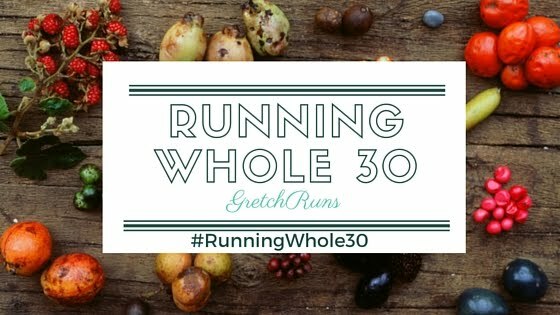 Don't forget to join our Facebook group and use the hashtag #RunningWhole30 !! Any tricks for meal prep? Girl you are going to be cooking up a storm! But I am excited to see what all you come up with! This is perfect especially for eating at the office which I do! Alright, alright. You got me. I'm not committing to anything, but I'm def going to do a lot of these meals. I'll have to check back for the recipes and I love that you included a shopping list. You're the BEST! YES!! My work here is done :) I'm so glad you liked this! Okay, so... I prepped the chicken. It's all marinating nicely in a freezer bag in the freezer. I chopped up the carrots and celery and they're in a container in the fridge. I made the burrito meat in the crockpot and it's in a container in the fridge. I chopped up some cabbage, cilantro and threw in some julienned carrots and they're all good to go for the burrito bowls. I bought a roast, and it's all ready in the fridge. I roasted sweet potatoes and sauteed some kale and it's all mixed together in a container, also in the fridge. And I ate a bowl of it today. I've probably pooped more times in one day than I have in the last 10 years but hey. Progress. And bum cream. 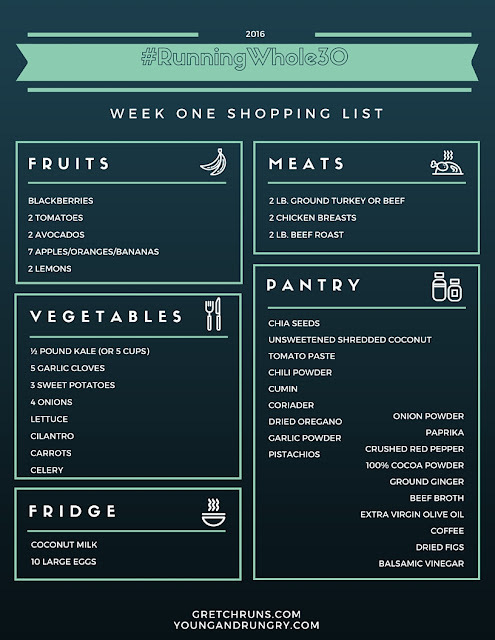 Take this with a grain of salt since I only made it halfway through last time...but I don't see anything listed as a pre-workout meal/fuel, and you may be a little short on fat in your meal plan. I found that if I wasn't getting a substantial amount of fat with each meal that I was very unsatisfied and needed to snack between meals. Once I upped my fat I was down to my 3 square meals a day. This is awesome!!! I'll be all ready to start when I get back. That sweet potato hash looks SO good. I'm hoping to really step up my meal prepping this month! Gretchen this is perfect and you are going to kill it in the Whole30! Planning and organizing is key and you are so good at both! This just got me even more excited! Thank you so much Margaret! I feel so much better and happier when I'm organized, so this is a great way for me to start the new year :) Thanks for being my partner in crime! This is amazing! You're doing so good. I made a huge mushroom, spinach, broccoli, and tomato frittata to have for breakfast all weekend. What were the tips, guidelines or procedures in practicing my meal plan? I know all the answers here in this article. oh i like the mason jar scrambled eggs idea. i would totally eat those for breakfast if i could make them at work! Just saw your snap for tonight's dinner - YUM!! You really ate well for Whole30! It's such an interesting way to think about food. Thanks for linking up to #BestofBlogs tweeting! our article advises about various types of vacuum food sealers. Please keep up the good work.